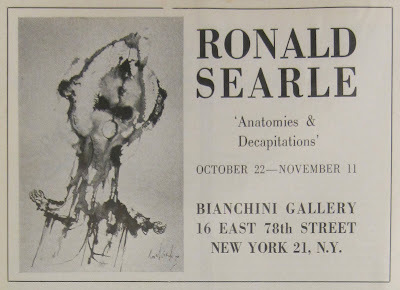 After moving to Paris from London in 1961 Searle made a series of abstract expressionist works he titled 'Anatomies and Decapitations'. Of course it's impossible to speculate on the artist's state of mind but it was perhaps an effort to express the anguish over the situation he left behind -the decision to leave a faultered marriage with two children. The series could also have been a bid to achieve more respect from the art world as a 'serious' artist. 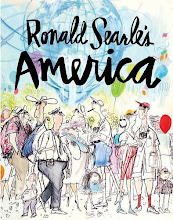 It seems Searle wanted to be taken more seriously by the public and cultural arena after 15 years of commercial success in England. 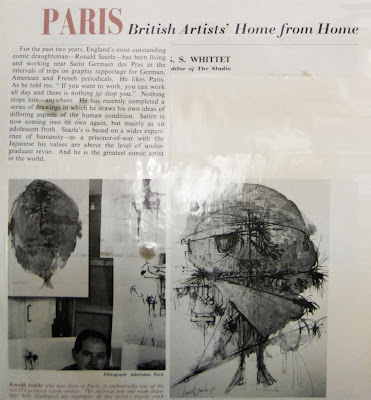 It's well known that Searle felt pigeon-holed at home and the 'Anatomies' could be seen as an attempt to re-invent himself. 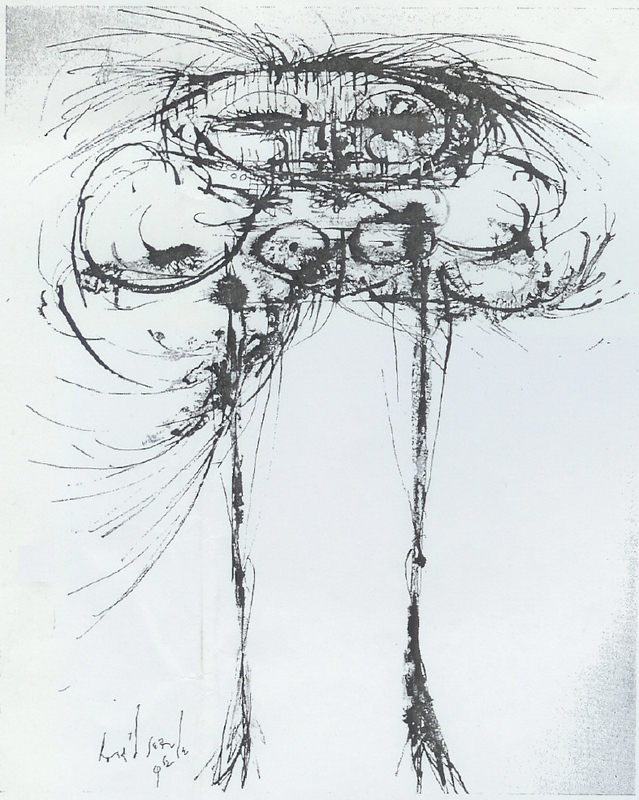 UKJarry interprets the images thus: 'Largely unknown to the general public, Searle had been making extreme investigations into how far he could go in abstract representations of human beings. In 1962-63, he had worked on a series of ink and wash compositions he titled “Anatomies and Decapitations”. Exhibited in only a few galleries, they disturbed many of Searle’s firmest admirers and have never been published. 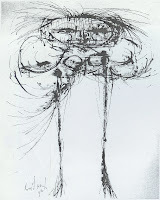 They are the most abstract work Searle has ever done. They almost all either huge heads or a few distracted skeletal figures reminiscent of late period Picassos. Some are just splayed slashes of lines, others are circular or oval stains with blotches or sequences of scratches for features. A rejection of his apparently perfected professional style, they resemble nothing Searle had done before. 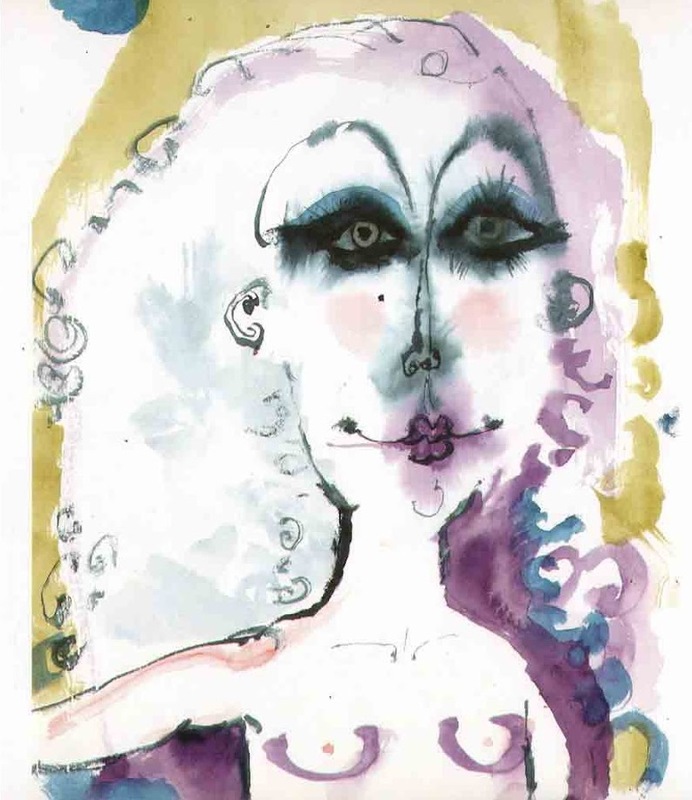 Yet in each Searle is able to find a means of presenting a figure who looks beatific, moronic, anxious, prim, or explosive. 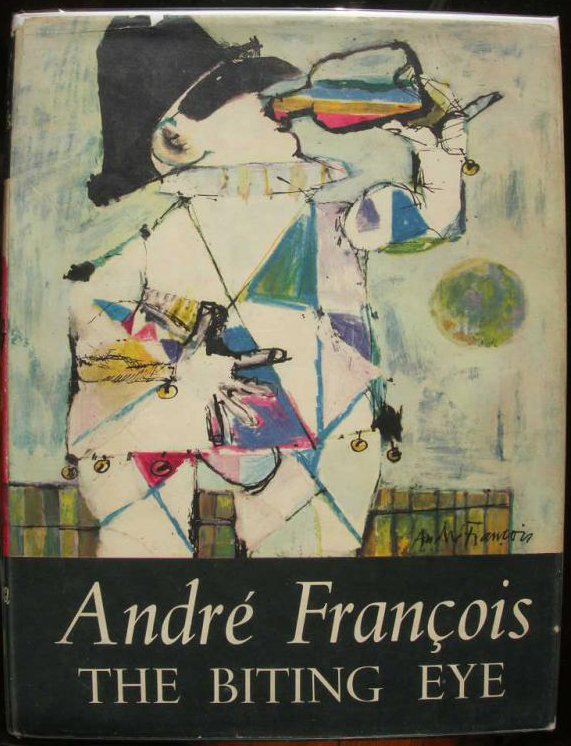 It is tempting to detect the influence of Andre Francois in these works (as Francois’s work in“Punch” was a similarly intense influence on emerging graphic artists like Ralph Steadman, Gerald Scarfe, and Quentin Blake). 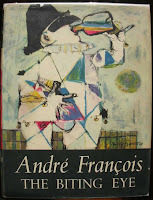 In 1960, Searle’s Perpetua Press had published a collection of Francois’s work, “The Biting Eye”. 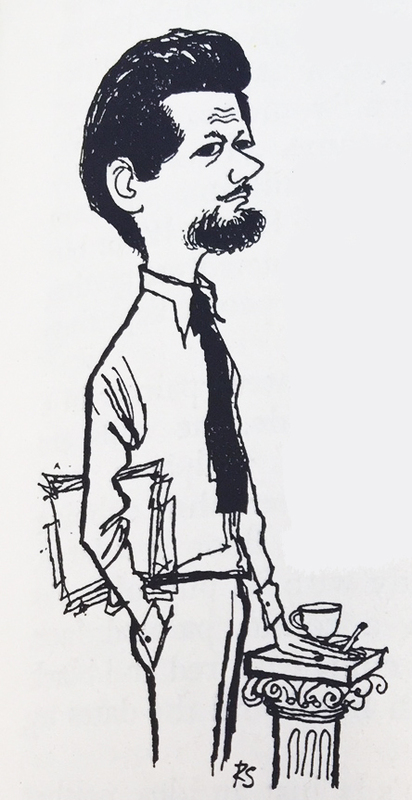 Francois drawing style was scratchy, messy, blotchy. 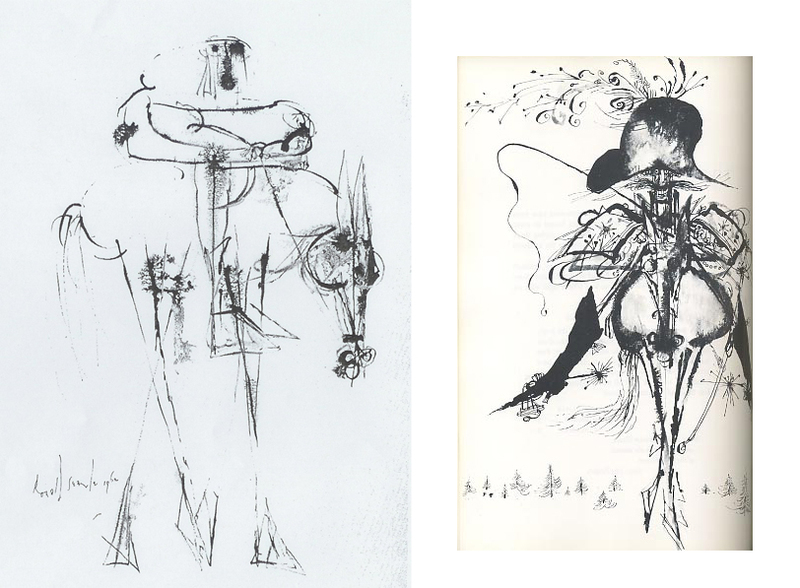 His deliberately rudimentary and scribbly figures were not the standard blocky cartoony figures. Despite being highly non-representative, Francois’s work captured something essential about humans and their behaviour. 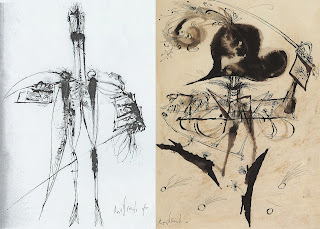 Likewise, “Anatomies and Decapitations” shows Searle discovering how he could convey complex emotions freed of the restraints of human particularity or the contexts of social customs. 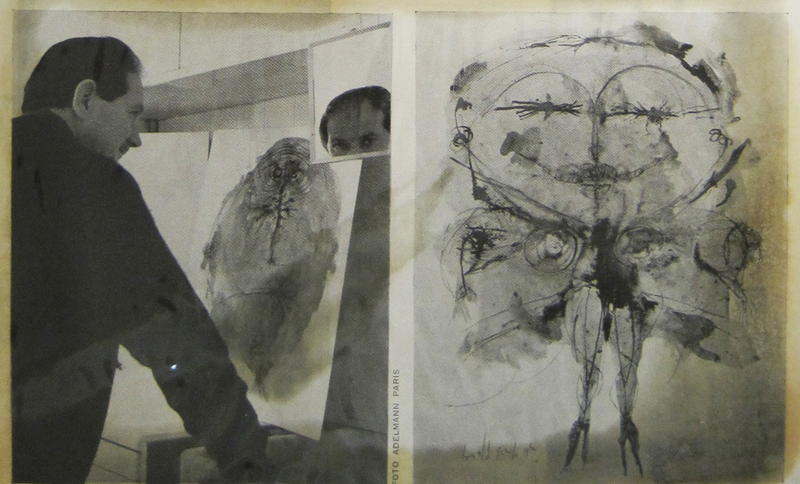 The first real product of these investigations intended for a popular audience was Searle’s Cats (1967). 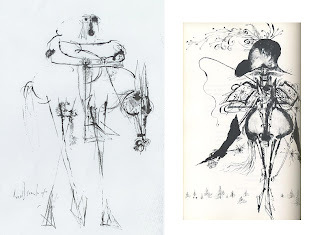 Searle had previously worked with animals, illustrating Geoffrey Willans’s The Dog’s Ear Book (1958), but those had been cartoonish animals, akin to the trotting figures of the Molesworth books, shaggy human actors in human situations with human responses. 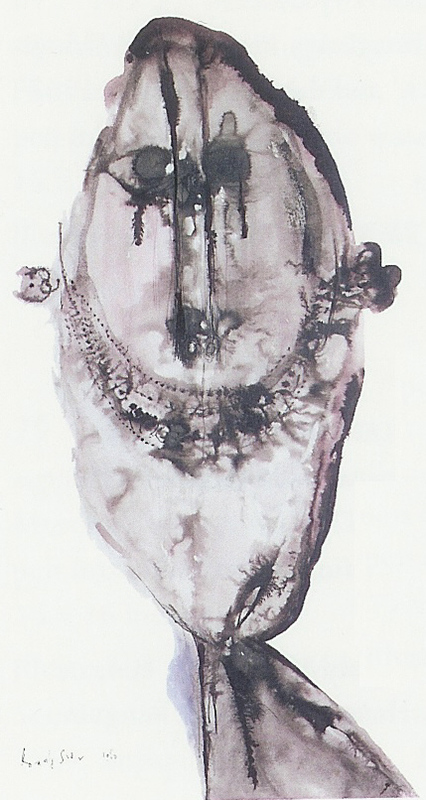 Searle’s cats would be much more abstract in composition. As Searle’s humans become less figuratively real, so he uses his cats to represent human states without relying on reductive realism. 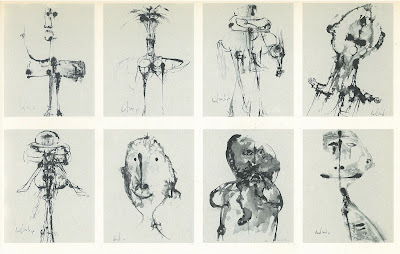 . .
Devoid of any background, through the shape of the cats’ bodies and arrangement of the minimum of facial elements, Searle embodies mournful, complacent, persevering, avaricious, or aghast expressions to match his titles. 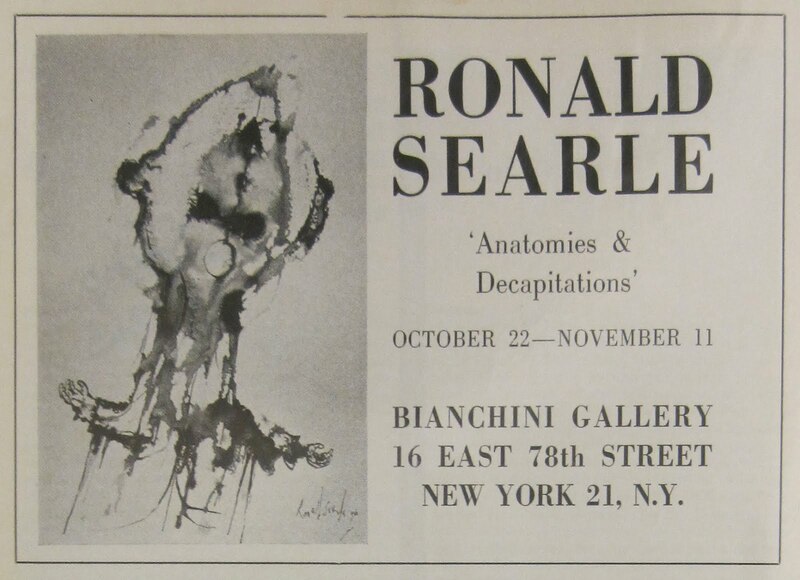 Searle would later redraw many of the works in his first Cat book, but in the earliest edition, their origin in “Anatomies and Decapitations” is apparent. 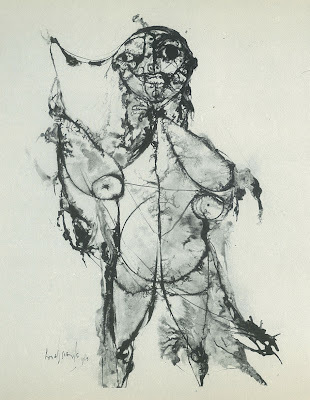 These were much messier creations in blobby inks, with rather splashy harsh gray washes like the blotchy faces of “Anatomies and Decapitations” spread out to occupy a theoretical cat-space with slashes for whiskers. . .
'The accompanying reproductions are a token of the large pen and wash drawings that have been done in the past year. I saw them in Paris last October and was completely set alight by them. The artist regards them as a culminating point of the years of exploring in graphic work from which they developed 'quite naturally and normally' (sic)! 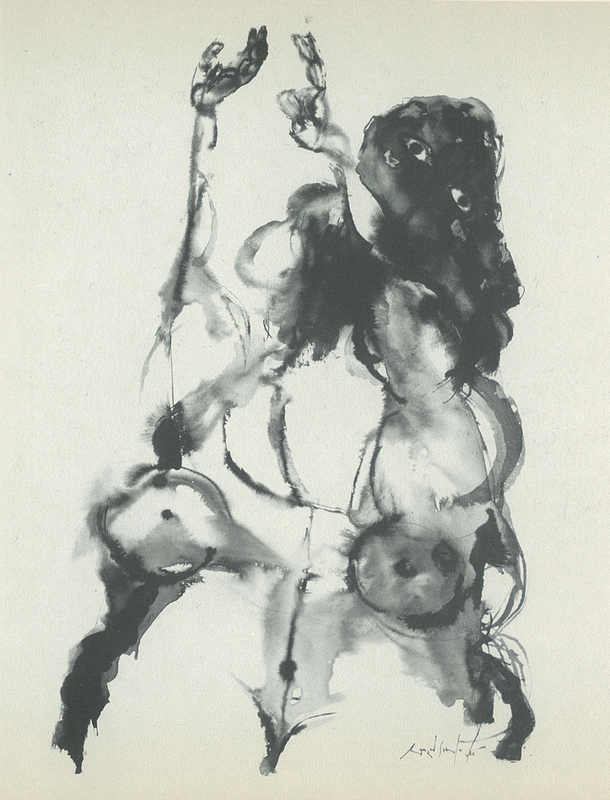 He says: 'I had been seeking a way of "anatomizing" the character and behaviour of people in our own curious and suspended times; after a period of fumbling I feel I am beginning to state a little of what those feelings are. 'They are meant to be satirical and, in the best sense, rather uncompromising. As satire is basically a parasitical art- only thriving where there is weakness-the frailty of human character is my mushroom bed, or occasionally my mistletoe bough.' The artist's prose abounds in such visual imagery. I love the Münchhausen drawings. I am still amazed that the originals we saw in Hanover were so small. I had always imagined them to be large drawings because of the vivid line work. Yes! The scale of Searle originals always surprises me- some are much bigger than I'd imagined such as the Punch Theatre drawings. Looks like the 'Anatomies' are quite large. I never cared for these "Anatomies," but as you point out they did lead into a truly formidable stage of his career. Yes, a peculiar bid for more artistic integrity yet the series still exhibits cartoon-like features. Playing with ink like this was probably more soothing & cathartic than anything . Also presumably a quick & economical way to generate a large volume Of work in order to get a show together. The Bianchini gallery would later become known for showing Pop Art . My god, now I know what it’s like to open a tabloid newspaper, and see paparazzi shots of oneself stepping out of the shower in an excess of blotchy, saggy, cellulite-raddled shame. That’s a lot of avert-your-eyes verbiage by me. But the rest of this is great. 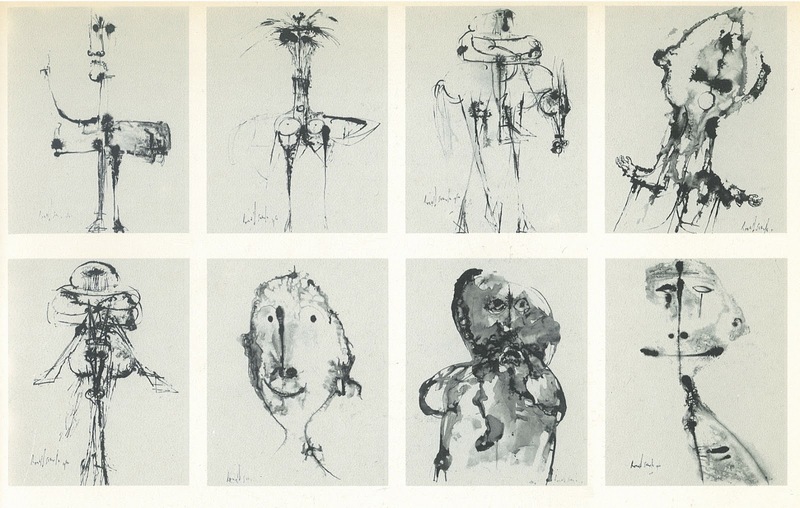 About half of these I’ve never seen before, and the five or six naked women in calisthenics poses are really something totally different by Searle, though they make think a little of Picasso’s Vollard suite for some reason. Is there any chance of getting them in higher resolution? Again, thanks for all the work you do here. Hah! Your writing wasn't that bad. I found the unseen ones in the catalogue of the 1974 retrospective at the BNF- that's the best quality I can get- most were reproduced small. One day we'll see these published I'm sure . . . 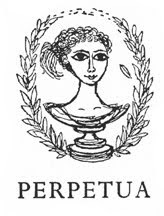 Truly, the Picasso of satirists! 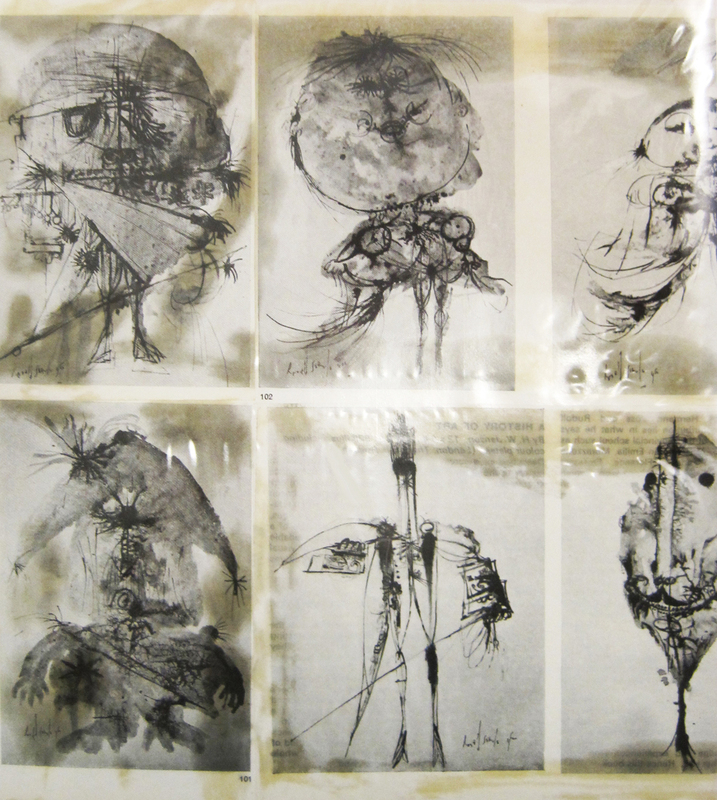 Added more material collated from Searle's personal archive at the Karikatur Museum, Hanover.